Your loan needs are a primary source of our business. That’s why we have a full line of consumer and business and agriculture loans. And we have Companion Products that make it easy to access your account information and make sure your payments are always on time. The following are examples of the types of loans we make. For more information, or if you have a need that you don’t see, just give us a call. As a community bank, we can structure a loan to fit your situation! Our decision about your loan is made locally, based on all aspects of your situation. Whatever your personal loan needs, we’re here for you. Call to apply or make an appointment today. We�ve partnered with ICBA (Independent Community Bankers of America) and TCM Bank to offer you the best credit card options. Click here to print an application to send to the application processing center. You will also find all the credit card disclosures, a �Question and Answer� section, and instructions for using the Prepaid Business Reply Envelope. If you prefer, call us and we will send an application to you. Personal Loans can help in an emergency. Auto, Truck, Boat, ATV, and Snowmobile Loans are quick and easy. We make sure your property value is secure. Home Equity Loans for almost any purpose are a great way to save on taxes while using the value of your home to secure the loan. We have regular amortized equity loans and lines of credit. Flexibility for your needs. Real Estate Loans often begin with the purchase or construction of your first home, or the purchase of land for future building. This is a very exciting event for you, let us make financing easy. If you’re a first-time homebuyer and want some help learning about the process, click here for a free online Home Owner’s Education Course. We also offer refinancing of existing mortgage loans. We have several options for you. Pursuant to the Bank's Mortgage Loan Originator Registration and Monitoring Policies and Procedures for S.A.F.E. Act Compliance (the "Policies and Procedures"), the following Bank employees have been identified as "mortgage loan originators" as identified under the Secure and Fair Enforcement of Mortgage Licensing Act. We’ve helped our business community thrive for many years. Whether you’re an experienced business person or are thinking of starting a new venture, we’re here to help you reach your goals. Since our decisions are made locally, we can work with you to quickly find the best loan option for your situation. 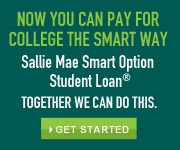 We’ve partnered with Bankers’ Bank and Sallie Mae to offer you the best student loan options. Automatic Transfers to loans are easy to arrange. Your payment will always be on time, and you don’t have to come to the bank or waste a postage stamp. We can arrange to transfer funds on a regular basis. Transfers to savings on payday will ensure that you reach your savings goals. Transferring funds to make a loan payment will save postage, reduce the interest you pay on your loan, and prevent late fees. Your statement will provide the details of the transfer.